2.08 This section covers recommended tooth proportions and dimensions of blanks for generated straight bevel gears of tooth ratios in general industrial use. 2.09 Bevel gears in this system have unequal addendums and unequal tooth thicknesses, except for pairs having equal numbers of teeth. This is different from the common practice for spur gearing. In bevel gear cutting, the tooth thickness is controlled by machine adjustments instead of by the tools, making it possible to obtain tooth thickness according to requirements for balance of strength in gear and pinion. Consideration has been given to both surface durability and beam strength in determining the tooth proportions. 2.10 An advantage in designing bevel gears according to this system is that tables are available giving tooth data and machine settings, thus minimizing calculations. * If other tooth designs are used, the data must be determined specially. 2.11 Angular Bevel Gears are bevel gears whose shafts are set at an angle other than 90 degrees. 2.12 Backlash - Table 2.4 gives the recommended backlash when the gear and pinion are finished and assembled ready to run. Quality numbers referred to in the table are defined by the AGMA Gear Classification Manual, AGMA 390.02. They connect intersecting axes and come in several types. The pitch surface of bevel gears is a cone. They are useful when the direction of a shaft's rotation needs to be changed. Using gears of differing numbers of teeth can change the speed of rotation. They are usually mounted on shafts that are 90 degrees apart, but can be designed to work at other angles as well. These gears permit minor adjustment during assembly and allow for some displacement due to deflection under operating loads without concentrating the load on the end of the tooth. For reliable performance, Gears must be pinned to shaft with a dowel or taper pin. Bevel gear sets consist of two gears of different pitch diameter that yield ratios greater than 1:1. The teeth on bevel gears can be straight, spiral or bevel. In straight bevel gears teeth have no helix angles. They either have equal size gears with 90 degrees shaft angle or a shaft angle other than 90 degrees. Straight bevel angle can also be with one gear flat with a pitch angle of 90 degrees. In straight when each tooth engages it impacts the corresponding tooth and simply curving the gear teeth can solve the problem. Spiral bevel gears have spiral angles, which gives performance improvements. The contact between the teeth starts at one end of the gear and then spreads across the whole tooth. In both the bevel types of gears the shaft must be perpendicular to each other and must be in the same plane. The hypoid bevel gears can engage with the axes in different planes. This is used in many car differentials. The ring gear of the differential and the input pinion gear are both hypoid. This allows input pinion to be mounted lower than the axis of the ring gear. Hypoid gears are stronger, operate more quietly and can be used for higher reduction ratios. They also have sliding action along the teeth, potentially reducing efficiency. A good example of bevel gears is seen as the main mechanism for a hand drill. As the handle of the drill is turned in a vertical direction, the bevel gears change the rotation of the chuck to a horizontal rotation. The bevel gears in a hand drill have the added advantage of increasing the speed of rotation of the chuck and this makes it possible to drill a range of materials. The bevel gears find its application in locomotives, marine applications, automobiles, printing presses, cooling towers, power plants, steel plants, defence and also in railway track inspection machine. They are important components on all current rotorcraft drive system. Spiral bevel gears are important components on all current rotorcraft drive systems. These components are required to operate at high speeds, high loads, and for an extremely large number of load cycles. In this application, spiral bevel gears are used to redirect the shaft from the horizontal gas turbine engine to the vertical rotor. Phone: 1-888-BUFF-GEAR High Precision Gear Products for highly specialized projects. Company Profile: Manufacturer of straight bevel gears cut to Gleason "Coniflex" system. Custom manufactured to customer specifications & materials. 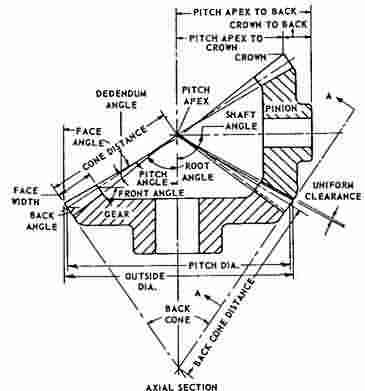 Pitch diameter to approximately 8.5 in., metric. Company Profile: Gears for every industry & application. Fine & medium pitch gears up to 8" diameter. Close tolerances. Job shop with production capability. ISO 9001 certified. Company Profile: Manufacturer of bevel, helical, spur, worm, straight & spiral bevel gears made of materials including brass, bronze, steel & cast iron. Available in nickel & chrome plating. JIT delivery. Company Profile: Bevel gears. Power transmission equipment. Obsolete, bearings, belting, chains, clutches, controls, gearboxes, motors, sheaves, sprockets, rollers. Company Profile: Bevel gears, gearboxes, gear trains, gear drives. Military specification, marine, bevel, helical, planetary, reduction, right angle, robotics. Built-to-print, second source & outsource manufacturing. Company Profile: Custom bevels: straight & spiral up to 36 in. Dia./2 pitch. Manufacturer coniflex type. Precision parts in all materials made to order from customer specs. Company Profile: Custom manufacturer & distributor of gears including bevel, worm, helical, metric, & miter gears. Gears are available up to 98 in. diameter. Company Profile: Full surface porosity-free joining, dissimilar metals & geometries. ISO/QS compliant. Company Profile: National distributor of a full line of gears, gear rack, sprockets, pinions & pulleys in stock sizes & made to order specs. Company Profile: Manufacturer of nickel & chromium, Teflon® coating, stainless steel. Electro, diamond dust, mechanical & hand polishing, ceramic, machinery rebuilding, welding & machine shop work service. Company Profile: Rep. of mechanical & electrical motion control products. Provide service in the power transmission field.